If you ask a realtor whether to hire a real estate agent or a lawyer to buy a house, you can pretty expect the realtor will suggest hiring an agent. On the other hand, if you ask a lawyer which type of representation is better — lawyer vs real estate agent — the lawyer will probably say hire a lawyer. Each profession has its own advocates, but the best solution is neither of those options. It is both of those options. Now, we know what you're thinking. You're thinking if you are buying a house, you are not paying for an agent to represent you, the seller is paying that fee. So, why would you want to spend money you don't have to spend to hire a lawyer? Some buyers want the legal protections and advice only a qualified and competent real estate lawyer can provide. If you talk to some lawyers, they might say you should hire a lawyer and not a real estate agent because a lawyer can provide both services. The trouble with that idea is few lawyers professionally sell real estate. It's a hat they don't often wear. 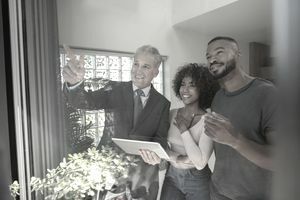 Lawyers might not know the specific neighborhoods, how to prepare a comparative market analysis, draw a real estate contract, or anything about the listing agent nor the profession of real estate, much less how to spot defects, negotiate for repairs nor any of the other dozens of tasks an experienced buyer's agent performs. On the other hand, real estate agents are not licensed to provide legal advice. This means they cannot answer a legal question, even if they know the answer, without breaking the law. An agent could potentially lose her real estate license if she tried to practice law. Unfortunately, many real estate clients cannot differentiate between a legal question and a real estate question. If it pertains to real estate, many buyers don't see it as a legal question. They will say so, too, after nodding their heads that they firmly understand an agent can't give legal advice. They will say, "OK, I won't ask you a legal question but how do you think I should hold title?" Which is a legal question. Now, if a buyer wants to know how many square feet are in an acre, which is 43,560, an agent can answer that question. But if a buyer wants to know the ramifications of a shared driveway easement, that is a legal question. About now, you're probably thinking well, what good is a real estate agent then if she can't answer any legal questions about real estate? You would not be alone in that thinking. It's frustrating for a buyer. Another example is can I cancel this purchase contract and get my deposit back? Again, a legal question, not a real estate question. An experienced agent might point to the paragraph in the purchase contract pertaining to the return of earnest money deposit and she might disclose what usually happens with regards to her experiences, but she can't advise a buyer to sue the seller nor guarantee the deposit will be returned. If she knows the buyer's deposit is at risk, she might share a few situations about the way her clients handled these matters, but in the end, she will be forced to suggest a buyer obtain legal advice. It is not that the buyer's agent does not want to help, it's that she can't give legal advice. Further, if she violated the law and expressed a legal opinion, a buyer could not rely on it anyway. Lawyers typically charge a few hundred dollars an hour. A brief consultation is the better way for a buyer to obtain legal advice than to try to squeeze it out of his agent, just because he doesn't want to pay a lawyer. So there you have it: Use a real estate agent for real estate advice and a lawyer for legal advice.